Our household as often used Zoflora products for many years. 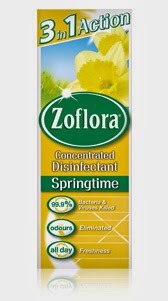 Zoflora is a concentrated disinfectant which leaves a lovely small afterwards. Given the terrible winter we have had and that I've been thinking about Spring for a while I decided it was the perfect time to use. Normally we would use Zoflora within our dogs area as its safe for them when the area is dried, however the kitchen and bathroom got a makeover first. Zoflora is to be diluted at a mix of 1 in 40 ration, however can be used undiluted down drains or in ceramic or metal sinks or toilet bowls. I gave the bathroom and kitchen both a good spring clean on the surfaces, floors, sinks and toilets. Everywhere had a good clean and was left smelling lovely. There was no lingering smell of anything and I felt safe knowing Zoflora kills 99.9% of known viruses and bacteria. I have since used some to clean the dogs area, there is no lingering wet dog scents around - which is always lovely.! Disclaimer: I was given a bottle of Zoflora for an honest review. All opinions are my own and not influenced. That is useful to know you don't have to just use it on floors. I like cleaners that smell fresh so this looks ideal. Some really great ideas there, I like the idea of using it in a trigger bottle. A bit cheaper than using pre-mixed sprays.